Ticket to Ride is a strategic board game by Days of Wonder, Inc. available only on the iPad. This title is a very faithful port of the popular board game, and while it was released a few months ago, Days of Wonder updated it this week to include multiplayer capabilities on one iPad. So how does the iPad experience measure up to playing the real thing? Simply amazingly. If you’re unfamiliar with the board game version of this app, Ticket to Ride is a turn-based strategic train building game in which the object is to lay the most track across the turn of the 20th century United States. On each turn, you have the option to draw cards to help you lay track, or build track to try to meet your goal of connecting different destinations. As you lay track, you score points, and when you successfully complete a route, you receive the number of points that route is worth, depending on the difficulty. This game combines elements of chance and strategy as you attempt to meet your goals while blocking your opponents tracks, and is a LOT of fun. When this app was first released, local multiplayer was noticeably absent, though online play via Game Center was supported. 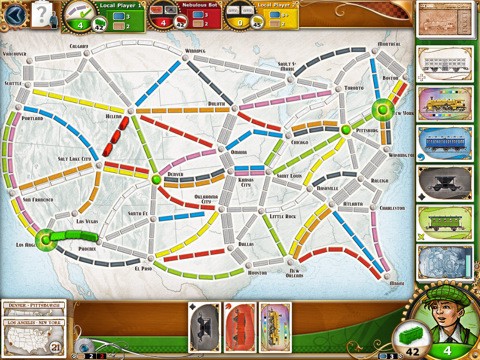 And while the online multiplayer is superb, with lots of players online at any given time, it was disappointing to not play the game with friends and family in the room — especially given the rather difficult setup of the physical board game (which includes over 100 train pieces, cards, and somewhat complicated scoring system). But with the new addition of pass-and-play support, up to five of your friends can play on the same iPad (though only one person can look at the device at any given time as all of your cards are displayed — something you want to keep a secret from everyone else). Pass-and-play shouldn’t replace the actual board game on game night, but it is a whole lot of fun if you either don’t have the board game, or if you’re somewhere where the real game would be impossible to play (say, a train!). Ticket to Ride features period-style music throughout, wonderfully detailed artwork that’s both reminiscent of the board game and early 1900’s train stations and (occasionally annoying) authentic train whistle noises signalling the end of a turn and train engine noises as you lay pieces of track. If the sound effects get on your nerves, you can always turn them down, or even mute them, but unfortunately the music cannot be replaced by your own device’s music. Hopefully this is a feature that will be added soon, as Days of Wonder has already addressed many issues fans had (most especially the pass-and-play mode). Ticket to Ride by Days of Wonder, Inc. is a fantastically detailed adaptation of the board game, and is quite simply a joy to play. The game’s simple rules are easy enough for most kids older than 10 to pick up, but the strategy and depth of the game will leave adults wanting to play again and again. And with downloadable maps and expansion packs, this is one game you won’t want to quit playing anytime soon. Ticket to Ride is available on the App Store for $6.99. With the latest version of Ticket to Ride you can now enjoy higher resolution graphics with support for the new Retina Display on the New iPad. This includes high resolution maps, cards, and a lot of cleanup and bug fixes, to make this already amazing game, even better. 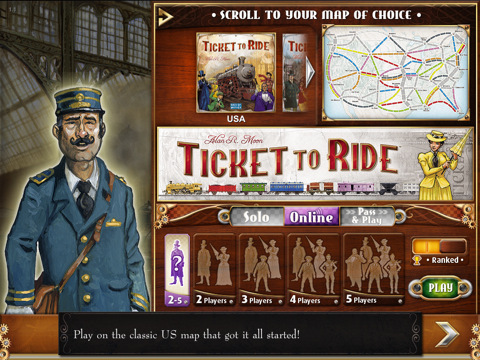 Developer: Days Of Wonder, Inc.
AppSafari review of Ticket to Ride was written by Alex Seiver on July 11th, 2011 and categorized under App Store, Board, Featured, Fun, Games, iPad apps, Strategy. Page viewed 5558 times, 1 so far today. Need help on using these apps? Please read the Help Page. I have had this game on my iPad for a few years now and I have only won once. It is the most difficult game to win I have ever played and is more frustrating than entertaining.